rabbit – Love your own cooking! 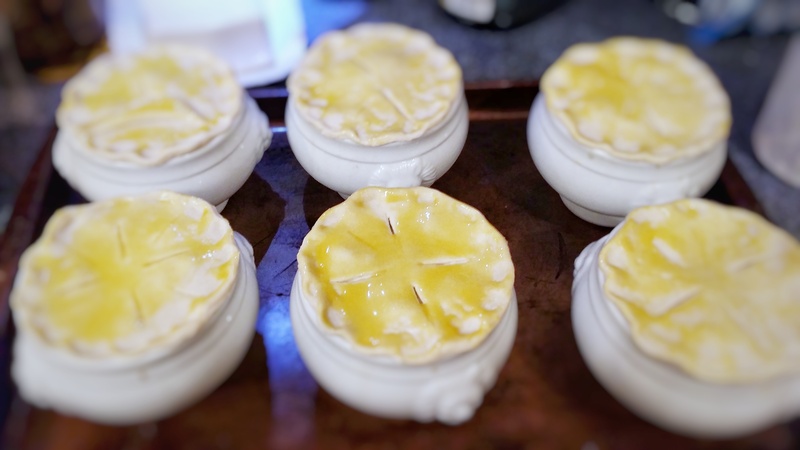 Individual rabbit pies, oh my! Don’t ever trust me to hold a box of croissants for you. I will eat it all and you’ll have no one to blame but yourself. It’s not just flaky, buttery pastries that I love. I’m a huge fan of French cooking in general. There’s not a single French dish I’ve tried and I haven’t loved. It’s not just flaky, buttery pastries that I love. I’m a huge fan of French cooking in general. There’s not a single French dish I’ve tried and I haven’t loved. 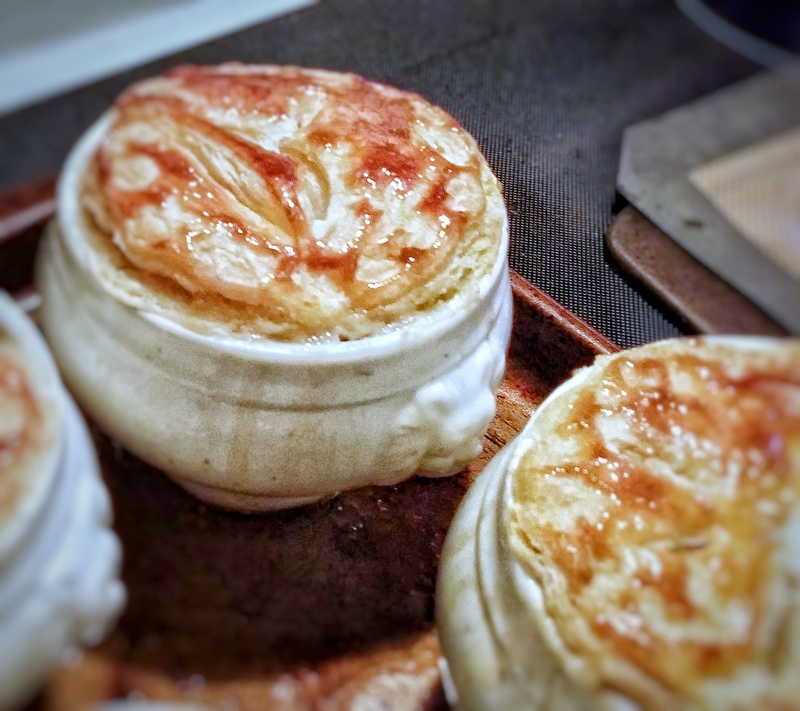 Imagine my joy when I discovered a French recipe that combines flaky puff pastry with meat. 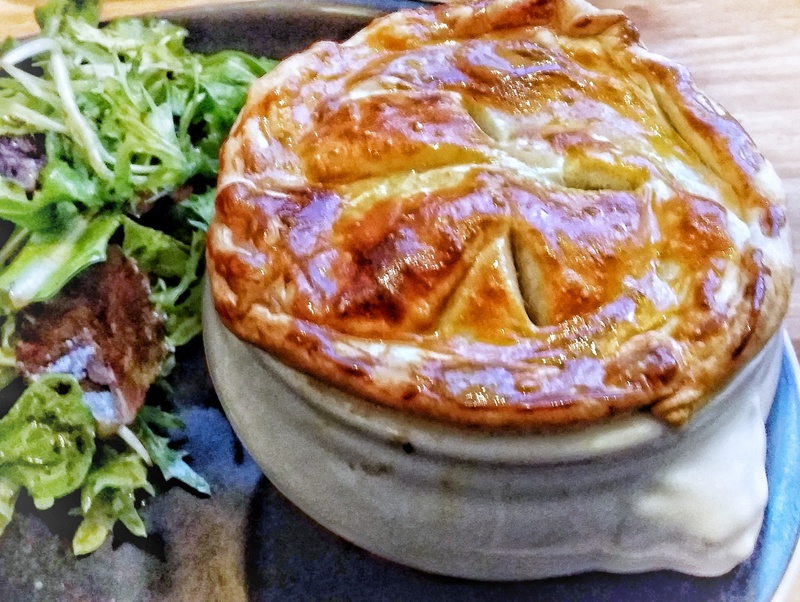 I’ve never had a rabbit with mushroom and leek pie before I discovered the recipe in a friend’s cookbook: Lapin de Compagnie en aumônière. And boy did the recipe sound amazing! I’ve made it twice now and, I’ve modified the recipe a bit. I won’t kid you, it’s labor intensive. There’s no reason why you can’t substitute chicken for the rabbit if game-meat isn’t your thing. Chicken might even be more tender as rabbit meat can be a bit tough, but with this method, it turned out amazingly tender. To thicken the sauce the original recipe called for flour. But when my husband, Dave was on the ketogenic diet, I stopped using flour to thicken my sauces. Just allow a bit more time to cook the liquid down. When Dave had his pie, he gave me his pastry puff top. I didn’t complain. 2 small Porcelain Bowls . Every rabbit fits in two of these bowls. Not only are they pretty, but they are oven safe! 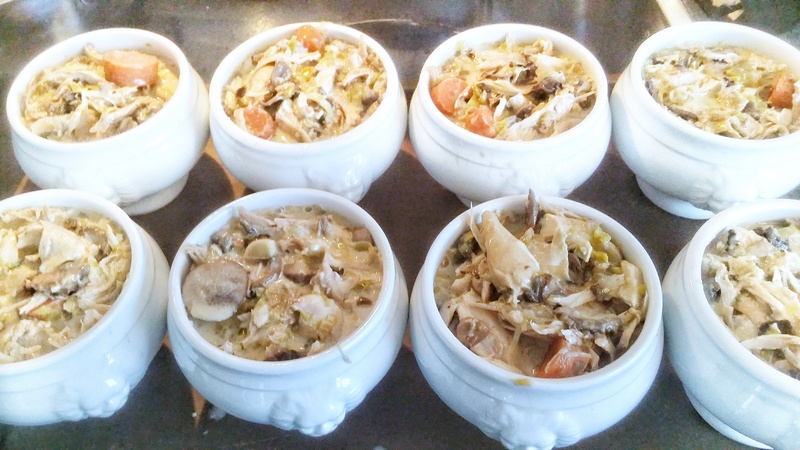 Combine the carrots, onion, green leek, celery, wine, chicken stock, bay leaves and thyme with the rabbit in a soup pot (or Dutch oven) and bring to a simmer. Sprinkle 1/2 teaspoon salt and a dash of pepper. Add a bit more water to cover the rabbit. Remove the carrots, onions, celery after about 20-30 minutes. DO NOT DISCARD! Save it in a separate container. Let the rabbit continue to cook in the stock for the full hour or until the meat can be easily separated from the bones. Then remove from the heat and cool to room temperature. Remove the rabbit from the stock and remove the meat from the bones. Try to shred the meat into smaller pieces with your fingers or a fork. Strain the stock, and throw away the bones. Cook the mushrooms and shredded white leek a saute pan with butter until softened, then combine with the reserved vegetables and shredded rabbit meat. Heat up the stock in a sauce pan and let it cook down until it’s reduced by half. Add cream and let the liquid thicken. Pour enough of the liquid until it coats the veggie and meat mixture. Then let it cool before dividing it into the ceramic serving dishes. As your mixture is cooling, preheat your oven to 400 degrees. Roll out your puff pastry and using a small dish cut out rounds that will cover your serving dishes with a slight overhang. Now place it gently over the top of the filling and crimp down the edges to seal each dish. Don’t forget to pierce few holes in the center of each pastry. Brush the pastry with egg yolk. I would place each assembled pie dish on a cookie sheet before popping it into the over for each removal. Bake for 30 minutes, or until the pastry puffs up and turns a beautiful caramel golden color.